The San Francisco 49ers have activated safety Jimmie Ward from the active/PUP list. Ward has missed the entire summer with a lingering hamstring issue. New defensive coordinator Robert Saleh is converting Ward from a cornerback to playing deep safety in his cover-3 scheme made famous by the Seahawks. Ward played safety in college at Norther Illinois. 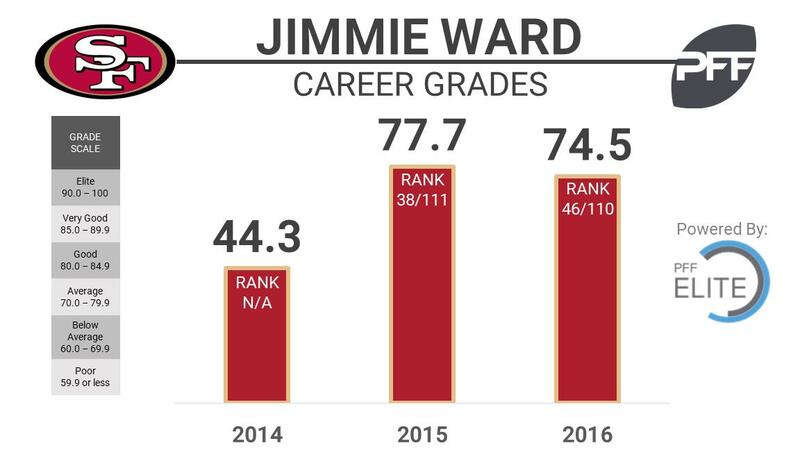 Ward has been a solid performer at cornerback in each of the past two seasons, earning an overall grade 77.7 in 2015, which ranked 38th and a 74.5 in 2016, which ranked 46th out of 110 qualifiers. Ward’s sure tackling will be well received transitioning to safety. Since 2014, he ranks second among all cornerbacks with a tackling efficiency of 25.0.